This delicious smoothie is the best of both worlds…pumpkin AND gingerbread! Try it topped with raw cookie dough for the ultimate treat. Blend all the smoothie ingredients together until creamy. 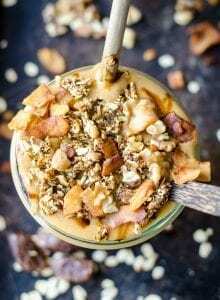 You can use less almond milk for a thick smoothie bowl or a bit more if you want to adjust the consistency. Pour into a glass and top with the cookie dough crumble (see notes). To make the cookie dough topping, add 2 small, soft pitted dates, 1 tsp of molasses, 2 tbsp of oats and a pinch of cinnamon, ginger and sea salt to a blender and pulse a few times until it forms a dough. If you don’t want to blend it, you should be able to finely chop the dates and mash it all up in a small bowl but a quick pulse in the blender works best.